For Toby Young, the Blob is the “anti-reform” brigade who include LSN founders Melissa Benn and Fiona Millar, as well as the Socialist Workers’ Party, the Anti-Academies Alliance, and the NUT. According to Conservative Home, I’m a member of the Blob, although I’ve been lukewarm at times in my support of the unions, helped my son’s school to achieve academy status, and I’m not a teacher-trainer. My crime? For daring to say that free schools will fuel social segregation. Gove himself fingered the Blob as the teacher-trainers in the universities who are supposedly motivated by Marxist ideology. Gove in turn took his cue from cue the former inspector of schools, Chris Woodhead, who shared Gove’s dislike of academics who espoused “trendy teaching methods”. I think it’s worth quoting these pundits in some depth for a few reasons. First, it shows that Gove did not lack friends in the media: just about every newspaper, including the leading magazine for teachers the TES, were strongly supportive of his policies. Second, they all share Gove’s central narrative which was that the education system was broken and it needed Gove’s radical surgery to cure it. Many, like Tony Parsons in the Sun today, are claiming Britain’s students will now be lost without Gove’s guiding hand. And finally, all of these blame the “Blob” for Gove’s removal. But was it “the Blob wot won it”, to re-coin the famous phrase the Sun used after Neil Kinnock was defeated by the Tories in the 1992 election? There are a few points to unpick here to answer this question fully. We’ll probably not know the full reasons why Gove was asked to go, but a number of newspapers, including the Guardian, reported that it was the private polling carried out by Cameron’s election strategist, Lynton Crosby, which finished him off, showing him to be toxic amongst voters. Were these voters all influenced by the Blob, their minds poisoned against the brilliance of Gove by evil trade unionists, Marxist academics and damnable trendy teachers? The saga of Gove’s downfall is fascinating because it’s a real-life parable about politics, media, education and the general public. If you had been consuming the media in the past few years, you could be excused for thinking that Michael Gove was tremendously popular because the overwhelming majority of commentators in the press presented him as the saviour of our schools. Possibly this slavish devotion made Gove and the government think that while there may be a few grumbles, everything was going along swimmingly. But it wasn’t. There were serious problems with Gove’s approach on personal, political and operational levels. First, there was Gove’s arrogant demeanour with colleagues. The most notable of these was Gove’s spat with the Home Secretary, Theresa May, which resulted in her writing a public letter to him in which she asked him if it was true that no one acted over earlier warnings about the putative Islamification of certain Birmingham state schools. The Trojan horse saga hurt Gove badly because it not only revealed he wasn’t “operationally” on top of things, but that his policy of academisation of schools, where schools are made totally independent of local authority control, inevitably led to some schools being hijacked by specific religious and cultural agendas. His free schools policy was particularly guilty of this, with many free schools being sponsored by religious or special interest groups such as the Steiner-Waldorf Schools Fellowship. It appears that his off-hand approach meant that he never listened to people’s queries about this within government; behind his polite veneer was someone who never listened. Second, there was how his policies played out “on the ground”. With Gove at the helm, education became the flagship policy for the Tories: legislation to encourage more academies and free schools, as well as numerous other reforms, was pushed through Parliament at break-neck speed in 2010 and Gove became the “front-line” minister for the Coalition in the media. There was rarely a time when he was Secretary of State that he wasn’t in the news. Having been himself a right-wing columnist, he was manna from heaven for the commentators. He’d make an announcement about there being a Berlin wall between the private and state sector, the need to get rid of school holidays and have 10-hour school days, the importance of free schools, the introduction of new tests for six-year-olds, the necessity for changes to GCSEs and A Levels and so on, and a legion of critics would be in the press the next day trumpeting their support. He gave important patronage to his supporters, putting his “yes people” in many corners of the educational establishment. He formed his own “Blob”, which I illustrated in a humorous diagram here. 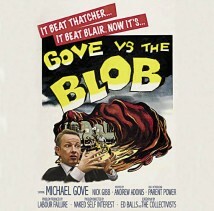 He created what one might call “Gove’s blob”: the “Glob”. He put his favourite “Globbites” put in vital positions in the DfE, in Ofsted, in the leading Academy/free school chains, in the exam boards and in Ofqual. Unlike the shadowy amorphous Blob he vilified, these were real people in real positions of power who devised key aspects of policy. Put together, they were the ones that said yea or nay to the creation of new schools, the funding of current schools, the shaping of new exams and curricula. But the problem was this played badly with parents, teachers and the general public at large. Many parents hated key policy initiatives like the scrapping of coursework for GCSE and A Level, the cutting of school sports programmes, the side-lining of Arts and creative subjects and the forced academisation of schools. They didn’t recognise Gove’s characterisation of the teaching establishment as a militant “Blob” but saw teachers working their socks off to do the best for their students. Gove became very unpopular with teachers. A YouGov reported this year that, where the Conservatives had been one point ahead of Labour in 2010 with teachers, under Gove’s watch they had fallen 41 points behind. Why was this? First and foremost, pay became a big issue: under Gove the vast majority of teachers lost out: pay rises were capped at 1%. The NUT claims that teachers have faced a 15% pay cut because their pay hasn’t kept with inflation and rising living costs. But while most teachers were suffering pay cuts, certain favoured people, like the heads of academy schools and chains, were enjoying eye-wateringly high salaries. There’s a veil of secrecy over how much academy chain bosses are paid but it’s not unreasonable to think that all of them enjoy salaries well in excess of 100K. The Guardian also reported earlier this year that millions are being poured into private firms because of the academies programme. This was as a direct result of Gove’s policies which gave huge power to a favoured elite. This was and is a true hegemony, not the mythical one suggested by Tom Bennett/ Richard Littlejohn et al: this is a hegemony where you can visibly see that certain people are tremendously powerful and really don’t have teachers’ interests at heart but are far more interested in their own pay packets. Gove’s introduction of performance-related pay seems set to make things even worse: it won’t raise standards, won’t motivate teachers and it will favour a sycophantic elite. What teachers want is fair pay, not a divisive system which gives far too much power to one or two people, usually headteachers or human resources departments, to decide who gets paid what. Added to which, teacher pensions were cut. Furthermore, the academisation of many schools has meant that our working conditions have worsened: I’ve heard too many teachers now talk about the appalling way they’ve been treated in certain academies. They would like to complain but know they can’t. Perhaps it’s not surprising then with such a demotivated workforce that educational standards in academies are no better than those in local authority schools overall. Gove clobbered the teaching profession and it’s meant we’re now facing a teacher-recruitment crisis. Who would want to go into teaching after Gove has messed around with it so egregiously? He’s turned it into a profession where we’re endlessly teaching to the test, where the creative subjects and creative thinking generally has been severely downgraded, and is poorly paid. He’s made conditions of service for teachers far worse than they were before he came to power. The truth is that Gove was an unmitigated disaster as an Education Secretary, in my view the worst in living memory. He chucked billions at his pet projects of free schools and academies, cut teachers’ pay and pensions, downgraded creative subjects, tyrannised teachers and students with criticisms, dictats and new exams, and didn’t raise standards at all. Finally, his boss woke up to the fact that none of his policies were popular with the public, and were, in fact, toxic. 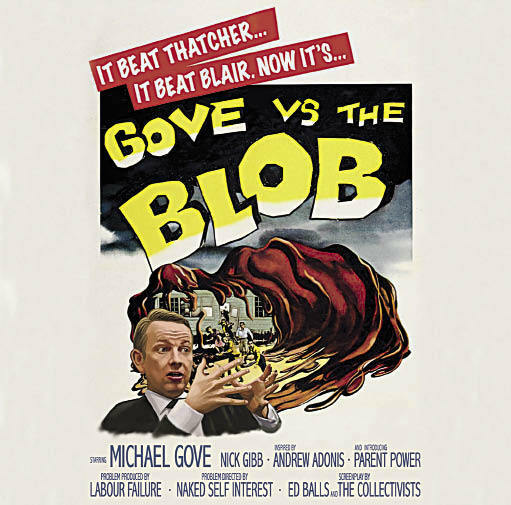 Sadly, it wasn’t the Blob “what won it”, but the fact that ordinary people got wise to Michael Gove’s chronic mismanagement of education. Now the Lib-Dems have got their way over sports funding, can we have more of their education policies please? What makes good teaching and how can we encourage it? If Gove likes Finland’s schools so much, why doesn’t he imitate them?